Imagine ambling down to your local farmers market on a sunny Saturday afternoon and being able to taste one or two sample-sized beers from your favourite, local brewery before purchasing a growler of fresh craft brew to throw into your recyclable shopping bags along with your organic organic veggies, free range eggs and fresh baked whole grain bread. Well here in BC, where adult consumers of alcohol are treated like children and it is illegal to sell or give out samples of any type of alcohol at farmers markets, yes. Government liquor inspectors to toss and turn all night and politicians run for cover at such suggestions saying it is not in the interest of public safety. But not so in a few places south of the border, such as Oregon, Washington State and New York State, where consumers can purchase and consume beer at farmers markets and in some cases wine and spirits (read here) and you know what, from the reports I have read and heard, there are no gangs of drunken youths or irresponsible adults overturning the organic apple cart. As a result, many other states are considering passing laws allowing booze sales at local markets. In a bid to raise awareness about this issue, The Campaign for Real Ale BC - Vancouver Branch (CAMRA Vancouver), has struck a deal with the Vancouver's Farmer's Market to set up shop at community tables provided at five different markets over the summer. To get market goer's attention, CAMRA are setting up a "pin" (20 litre cask) at their table with a sign saying "free samples". Once lured to the table by the thought of a free sample of cask beer, the consumer sees the fine print under the "free sample" sign explaining the illegalities of alcohol at farmers markets in BC and CAMRA representatives are there to answer questions and provide education about this issue and other CAMRA campaigns such as Fess Up to Serving Sizes (FUSS), Bring Your Own Craft Beer (BYOCB) and the Save Growler Campaign and about CAMRA Vancouver and what they stand for in general. If interested, people are also able to sign up for a membership onthe spot and join the CAMRA cause. CAMRA is also encouraging those who support the idea of beer sales at farmers markets to write Attorney General Suzanne Anton and her Parliamentary Secretary, John Yap to inform them of their desire to be able to sample and purchase craft beer at Vancouver Farmers Markets. To help get the letter campaign going, CAMRA has been printing out form letters which they are offering to mail if signed at the markets. The letter can also be downloaded from their website (download here) and mailed in by the consumer. "All the people we spoke to knew it was illegal but didn't know why," states CAMRA Vancouver President, Adam Chatburn on CAMRA's website. "A couple of the people who signed letters were visiting from Seattle and Oregon and were surprised that it wasn't possible for local artisan alcohol products to be sold at farmers markets." According to Chatburn, this is not a campaign pushing to have beer gardens and on-site consumption, other than limited samples and is about giving craft beer consumers the chance to purchase growlers from local craft breweries at Vancouver Farmers Markets. It is an idea that fits in with the concept of consumers buying locally produced products directly from the producer. CAMRA has taken the idea to the BC Legislature, where they met with several NDP MLAs and according Chatburn, the idea was well received, especially supported by long-time NDP MLA Jenny Kwan. Chatburn has also met with Vancouver City Councillor Heather Deal where he brought up the idea of beer sales at Vancouver Farmers Markets. 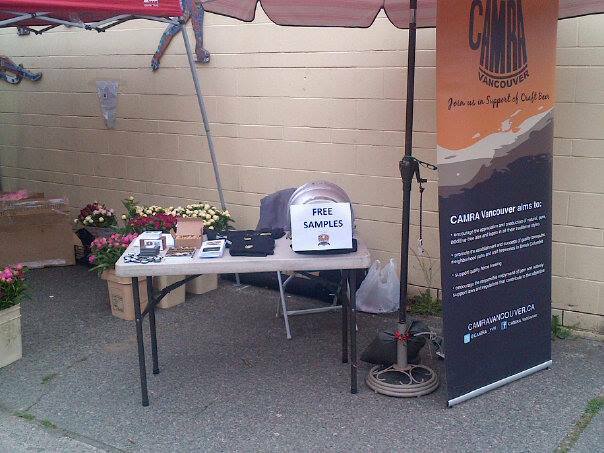 CAMRA Vancouver has already attended two markets, in Kitsilano and the West End and the response has been good. "Everyone who we spoke to about it at the markets agreed to sign a letter and we quickly ran out of letters at our first market, we also ran out at the West End market and in total so far we have over 100 letters ready to go," reports Chatburn. They are scheduled to be at the Main Street Market, July 10th, Trout Lake, July 13th and Kerrisdale August 10th. So if you are a CAMRA supporter and in favour of beer sales at Farmers Markets, get out and support the cause. Who knows, if enough people write letters at this time when liquor laws are being reviewed, reformed and modernized, we may soon be able to fill our growlers and buy great, locally-produced foods at BC farmers markets. BC Liquor Law Reform Post Election: Where Do We Go From Here? The election hangover has long past and British Columbians who were excited about the possibility of the NDP taking charge and following through on their promise to reform and modernize our provincial liquor laws "one practical step at a time" have come to grips with the reality that we have four more years ahead of us with the Liberals steering the political ship. Hopefully not four more years of the same old, same old in regards to BC liquor policies, liquor law enforcement and support of the craft beer industry. Liberals have made some positive changes to our liquor laws and policies over the past few years but have not "overhauled" them as they claimed in press release in Feb of this year (read press release here). The Liberal approach has been haphazard at best and reactionary, described by the NDP as a "piecemeal approach to liquor policy," and not a part of a systematic, comprehensive plan. The NDP had made it loud and clear before and during the election that they were committed to a full-on review of current BC liquor laws, which would have included a comprehensive consultation with the BC liquor industry, to work out an effective strategy to modernize our liquor policies which even the Liberals have described as our archaic. They have, to this point, also been very open to listening to consumers and I have had several meetings with several NDP MLAs where we discussed issues that negatively impact craft beer consumers. We will never know if the NDP would have been able to keep that election promise, but my sense is that the commitment is real and that they are ready to continue to push the Liberals, from the opposition side of the BC Legislature, to start a full review. Let's start with looking at those who will be playing the modernize BC liquor law game and how this may impact the craft beer scene, at least in the short term. Former Vancouver City Councilor, Suzanne Anton, has been appointed the new Attorney General and Justice Minister and the alcohol portfolio now falls under her ministry's umbrella. Anton may bring a new perspective and energy to old issues as she is new to provincial politics. A government backgrounder introducing the new Liberal Cabinet states Anton will, "(b)egin consultations to modernize B.C.’s liquor laws". When Anton was running as an NPA mayoral candidate during the 2011 Vancouver City Municipal Election she stated in an email to CAMRA Vancouver she, “would work closely" with organizations like CAMRA Vancouver and "review opportunities to expand and support" the craft beer sector in Vancouver. Let's hope she still has this mindset on the bigger provincial stage where she is actually in THE position to be a game changer for the craft beer industry and the consumers who support it. Anton will not be solely responsible for overseeing the massive task of reviewing and modernizing BC liquor laws. John Yap, probably best known as having been the minister in charge of multiculturalism who stepped down as a result of the recent Liberal ethnic voter scandal, has been appointed the Parliamentary Secretary to the Minister of Justice and Attorney General for Liquor Policy Reform. According to the government backgrounder, Yap will "(l)ead the stakeholder consultation on modernizing B.C.’s antiquated liquor laws and recommend improvements to the minister to take to Cabinet. I don't know much about Yap, nor do many I have talked to who are activists and advocates related to craft beer, so we will have to wait and see how consultative and invested he is in regards to liquor law review and reform. Liberals historically have not put much stock into what consumers want and have instead pandered to their political cronies or made changes to quell issues where media and public pressure was getting just a little too much. I am not very confident that the former multicultural minister who claims to not have known about anything about the ethnic voter scandal until the NDP exposed it will be on the ball enough to tackle the massive task of consulting with all the various sectors of industry that often have conflicting wants and needs in regards to liquor law changes. Great news for the craft beer scene in the BC is that NDP MLA Shane Simpson is back in the game and has been tasked with being the official critic in regards to the Liberal liquor modernization strategy. Simpson has been a great supporter of the BC craft beer industry and consumers in the past and supported campaigns such as CAMRA Vancouver's Fess Up to Serving Sizes (FUSS) and Bring Your Own Craft Beer (BYOCB), bringing these issues up for debate in the BC legislature. As well, Simpson played a huge roll in halting the Liberal's controversial plan to privatize the BC Liquor Distribution Branch's warehouse system and he has a vested interest in supporting the BC craft beer industry as he has four craft breweries in his constituency. Simpson is stand-up kind of guy and one who, at least as far as my dealings with him, follows through on what he says he will do. With Suzanne Anton and John Yap being tasked with overseeing the Liberal liquor policies, this means Rich Coleman is no longer in the game, at least for the moment. Coleman has been the minister in charge of the alcohol portfolio on and off for almost 10 years and it always seems to fall back in his lap when any whiff of controversy arises. Coleman has not particularly been the champion of the craft beer consumer and, at least from my perspective, is very wine-centric and does not take the craft beer movement very seriously. Coleman completely dismissed the FUSS and BYOCB campaigns and has continually snubbed the BC craft beer industry such as when he recently reported BC will appoint a special wine envoy charged with the task of finding new markets for BC wines while allowing his BC Liquor Distribution Branch to send a high ranking representative to Washington DC to give a talk on how American craft breweries can break into the BC market to compete with the locals who are already struggling to get shelf space in BC Liquor Store shelves. During the BYOCB campaign I sent Coleman an email trying to advocate for the inclusion of beer in the corkage program. In his response, he basically summed up his argument against corkage for beer and attitude towards the BC craft beer scene writing, "while we appreciate the evolving nature and uniqueness of the variety of beer, it is not in the same category as wine". Seeing Coleman distanced from the liquor scene is a huge positive in my opinion. Also out of the game is Karen Ayers who has been the General Manager for the Liquor Control and Licensing Branch (LCLB). Ayers and is seen by many as the person who has been most resistant to liquor law changes and who has the power to right liquor policy as she sees fit in some cases. From a distance, the LCLB appears to be like a fiefdom, with little to no accountability to the consumers and voters of the province. She has used the 2011 Vancouver Stanley Cup Riot as a scare tactic to continue justifying how all BC alcohol consumers should treated like children who have no self-control to act appropriately. Ayers announced her retirement just before the recent election and is to step aside at the end of this month. Under her watch, a culture of intimidation and bullying has been cultivated in the LCLB to the point where licensees and those with a financial stake in the liquor industry do not want to publicly raise issues or voice complaints for fear of retribution. The LCLB, under her direction, has enforced laws in a very inconsistent and random manner, hiding behind the often-outdated laws when convenient and ignoring them as insignificant when it suits them. You have to look no further than how Ayers has treated the Great Canadian Beer Festival (read here) while ignoring consumers' rights and consumer issues (here). There are many who were literally celebrating when Ayers announced her retirement and hopefully her replacement will be more open to change and considering other points of view other than her own. It will be interesting to see where this all goes. It seems both sides of the BC legislature are committed to reviewing BC liquor laws and it appears the Liberals are going to consult with the various sectors of the alcohol industry. Let us hope they include consulting with consumers and CAMRA BC, who have already reached out to the Liberals politely demanding to be included in the process. I do not hold out great hope that the craft beer voice will be heard as loudly as the other sectors of the alcohol industry here in BC, but I guess we will have to wait and see. Vancouver-area craft beer lovers literally hold the fate of brewery lounges in their own hands and have the rare opportunity to be consulted directly in regards to liquor law changes as yesterday Vancouver City Council officially passed a report from the Vancouver City General Manager of Planning and Development Services recommending that changes be made to City zoning and licensing by-laws to allow for the sale and consumption of beer in lounges located within breweries. That matter will now be referred to a public hearing, the final step in the approval process, which should be scheduled in a "few weeks", according to NPA City Clr George Affleck, whose motion (see here) started things moving forward. The public hearing is where those in the private and public sectors of the community get to come out and have their say on the matter directly to City Council so it is not just a rubber stamp type step in the process. If major opposition to beer lounges show up and successfully plead their case and those in favour are silent, or less prominent, the whole process could grind to a halt. "Until the public have had a chance to speak to it, I would not want to speculate on what will happen. But thus far, we have seen very little opposition to this and a ton of support," stated Clr Affleck last week after seeing the report which recommends breweries, distilleries and wineries be allowed to have licensed, on-site lounges, no bigger than 80 m2. To give you an idea of the size, if you have visited Parallel 49's tasting room, it is well within this size limit. Currently in Vancouver on-site (meaning at the brewery) patron consumption opportunities are limited to tasting rooms where breweries can charge for samples but are limited to selling 375ml per patron per day, otherwise samples can be offered to the public at no charge. Because of the fact that breweries cannot charge for their products in tasting rooms, few have bothered to build and staff them. This single change to Vancouver by-laws could change the face of the local beer scene in Vancouver completely and according to the report, gives breweries, "a more lucrative means of showcasing their product." It will help support small, local breweries and encourage new growth in the industry. You need to look no further in BC than to the wine industry who have been allowed this type of lounge for years. Areas like the Naramata Bench have taken full advantage of the lounge opportunity to draw tourists and locals alike to tour from winery lounge to winery lounge to try different wines from the source and purchase products. It is a far more intimate consumer experience and connects the consumer directly to the point of production. This type of lounge has has also helped make places like Portland Oregon and Seattle, Washington beer tourist meccas and they bring BIG dollars into the cities as beer lovers visit the breweries located within city limits to enjoy themselves. Food and entertainment will be allowed as well and if Vancouver sticks to the intentions of the Provincial Government when they made changes to the laws March 1/13, minors accompanied by responsible adults will also be allowed, making these lounges family friendly. This is the time for groups like CAMRA Vancouver to shine and make a difference by getting their members to come out to the meeting to ensure the pro side of the argument gets heard loud and clear. CAMRA Vancouver President Adam Chatburn has already been very involved in getting things to this point, having spoken to City Councillor Heather Deal a few months back in a private meeting and having spoken at the council meeting where the motion was presented. "CAMRA BC - Vancouver Chapter will be there all the way to represent the craft beer consumers of the city and we look forward to the public meeting where we will show just how important these positive changes are to the future of the city and the province," stated Chatburn last week. Let's hope craft beer consumers and industry types are as committed as Chatburn to come out the the public hearing so we can get this passed and written into law as I would like nothing better than to sit in a local beer lounge by the end of summer to enjoy a fresh, locally brewed beer straight from the source. I would hate to see the process get this far only to be scuttled by consumer apathy for getting involved in the political process. Vancouver craft breweries are one step closer to being able to offer their thirsty and adoring customers the opportunity to purchase and consume fresh beers from the source in on-site (at the brewery) lounges. In a report (read report here) received by Vancouver City Council from Vancouver City General Manager of Planning and Development Services, recommendations have been made to allow for amendments to the Vancouver zoning and development by-laws to permit licensed on-site lounges at breweries. The report was generated as a result of a motion, tabled by NPA Councillor George Affleck, requesting city staff to look into what changes needed to be made to Vancouver by-laws to allow for licensed, on-site lounges in industrial zones. The motion was passed unanimously April 23rd by Vancouver City Council and the report was presented to Mayor Robertson and City Council last week. In short, breweries located within Vancouver's city limits may be able to apply to have beer lounges by the end of summer, giving the Vancouver craft beer scene yet another boost and allow it to showcase fresh, local beers similar to how it is done in places like Portland, Oregon where beer tourism is BIG business for the city. March 1/13 BC liquor laws changed to allow breweries and distilleries to apply for endorsements to their existing manufacturer's licenses to allow them to have on-site lounges where they could sell their products directly to consumers to be consumed in the lounge, bringing them in line with wineries who have had that opportunity for years. Despite the ability under provincial laws, Vancouver City by-laws and regulations did not allow for the type of liquor liquor license required for lounges to exist in industrial areas that allow breweries, distilleries and wineries to operate. Currently in Vancouver, breweries can have tasting lounges where they are permitted to sell only one 12-oz beer per person, per day but are permitted to give out multiple free samples. They cannot have entertainment or even televisions! They can sell beer to be consumed off the premises, such as growlers and packaged products. I posted about the conflict here, a story that was picked up by mainstream media, and had attempted to get some response from Vancouver City Mayor Gregor Robertson and his City Council as to whether they had plans to make changes to support the desire by several local breweries to take advantage of the opportunity to apply to have lounges. After being repeatedly ignored by the mayor and his crew, I posted an open letter (read here), to Mayor Gregor and his council scolding them for their lack of accountability to the voters of Vancouver and as a result Clr Affleck, who described the open letter as "nasty", contacted me to take a meeting with him to discuss the beer lounge issue. After listening to what I had to say, Affleck saw how having such lounges in Vancouver would support the local craft beer industry and promote the city through tourism similar to what is seen in cities like Portland and Seattle. Mayor Gregor and his Vision Vancouver gang quickly jumped on the band wagon and threw their support behind Affleck's motion, stating they had been working behind the scenes on resolving the issues before Affleck's motion was tabled. I am not saying they were not doing so, as I really have no idea, but I can say that they were given ample opportunity to let those interested in the issue know and remained silent. I am fairly confident that if Affleck had not pushed the issue with his motion that the wheels of City bureaucracy would have turned very slowly and we would not be at this advanced stage in the process so quickly. "I am so pleased to see staff reporting back so quickly," stated Affleck. "The industry is on the verge of exploding in Vancouver. Changes like these, which help brewers and distillers succeed, is another step for Vancouver soon becoming an international destination for people passionate about beer and spirits." The report will go before City Council this week I am told and if accepted, it will be referred to a public hearing where anyone who wants to speak about the proposed changes can have their say in front of City Council. Unless there is major opposition that sways City Council to rethink their position, the recommended changes will then be written into Vancouver City by-laws and will become law. All reports I am hearing is that the whole process should be completed by the end of July. "I am hopeful that Council will pass this unanimously (Tuesday), thus sending it to public hearing process," says Affleck. "Until the public have had a chance to speak to it, I would not want to speculate on what will happen. But thus far, we have seen very little opposition to this and a ton of support." If the recommended changes to Vancouver by-laws are made, breweries, distilleries and wineries located in areas zoned M-1, M-2, I-1, I-2, I-3, IC-1, IC-2 and IC-3 would be allowed to apply for endorsements to have on-site lounges to a maximum size of 80 m2. Currently it is virtually impossible to run a lounge in these types of industrial zones (read here). Special event area endorsements will also be allowed and breweries will be allowed to hold up to 2 special events, i.e. arts and cultural events, a month. Although the majority of work has been done by city staff, the public hearing is still a roadblock. City Council will need to see supporters of the changes out at the hearing and hear them speaking as to why they should be allowed. I know the local breweries are banding together and CAMRA Vancouver is fully behind the proposed by-law amendments. In fact CAMRA Vancouver President Adam Chatburn spoke at the original council meeting where Affleck's motion was passed. "I'm pleased that the city council has moved forward on the issue of allowing beer lounges at breweries, there's still a long way to go but each step brings us closer to being a city that prides itself on our craft beer culture," stated Chatburn. "CAMRA BC - Vancouver Chapter will be there all the way to represent the craft beer consumers of the city and we look forward to the public meeting where we will show just how important these positive changes are to the future of the city and the province." So CAMRA members stay up-to-date on this issue as I am sure President Chatburn will put out a call for supporters to attend the public hearing. You can be sure there will be opposition and possibly from very influential and organized camps such as the BC Alliance of Beverage Licensees (ABLE), the industry association who represents BC liquor primary establishments, who have been making noises they are opposed to beer lounges at breweries, fearing competition. I have personally had a few on-line Twitter exchanges with ABLE's Executive Director Ian Baillie who seems very anti-lounge endorsements for breweries. So, stay tuned if you want to be able to amble down to your local craft brewery for a mug of your favourite brew. The ball is in our court and craft beer consumers and industry types can ensure these proposed changes get written into law by going to the public hearing to support the cause.